Decades of excellent service and continuous improvement have made the Woodstock Inn’s Suicide Six ski area a recognized and respected name for skiers of all abilities. With 30% beginner, 40% intermediate and 30% advanced slope ratings, there's a perfect trail for the skier and rider. Nearly a third for the 24 trails are rated for beginners, and experts love the long, one-mile run. Snowboarders flock here to enjoy one of the first ski resorts to allow snowboarding, site of the first National Snow Surfing contest, in 1982. Private skiing and snowboarding lessons are available throughout the day at the Snowsports School, one of the oldest continually operated schools of its kind in the country. Skiing & Snowboarding -- Killington’s nickname in parts of the skiing world is The Beast of the East. It is the biggest ski resort in New England, and it encompasses seven peaks, 200 trails, and five terrain parks. Vertical drop is 3,050 feet. Natural snow averages 250 inches a year, and artificial snowmaking covers 600 acres of skiable area. Naturally, with such vast spaces and resources, Killington offers a big variety of ski trails, from easy learning areas to steep gladed trails and everything in between. Everything Else -- Killington can be expensive. The resort has a village with skiing and boarding lessons and rentals; shops and a post office. Ice skating, sleigh rides, pool and hot tub, child care, dog sledding, spa, snow tubing. Full day care is available. The Killington area has scores of restaurants and bars, live entertainment at night, snowmobile tours and other winter fun. Skiing & Snowboarding -- This resort is located in the gorgeous Vermont town of Woodstock and it has a close relationship to the comfortable Woodstock Inn and Resort. It is very welcoming to families. Twenty-three trails with a vertical drop of 650 feet are served by two double chair lifts and a J-bar. One hundred skiable acres; 10 feet of snowfall annually. Snowboarders are welcome. Trails are rated 30 percent for beginners; 40 percent for intermediates, and 30 percent for advanced skiers, so there is enough variety of challenges on the slopes for everyone in the family. Fifty percent snowmaking. Rentals and lessons offered. Everything Else -- The nearby Woodstock Inn & Resort is a sweet spot for lodgings and it has a health and fitness center for getting fit or recovering. Also: ice skating, sleigh rides, and spa. 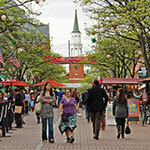 The town and area is filled with fine dining, arts, shopping, and seasonal events like its famous Wassail Weekend at Christmas, and many more. Skiing -- Mad River Glen, opened in 1948, prides itself on its old-fashioned values: the sport of skiing is king, and all other activities (like spas and parties and slope side condos) are secondary or just not to be found here. (Mad River has the last in-use single chair lift in the country.) The ski area’s famous motto is, "Mad River Glen Ski It If You Can." Despite this motto, the mountain’s 46 trails include beginning and intermediate trails. Nonetheless, Mad River Glen is home to some of the most difficult skiing in the East, with natural snow, plenty of bumps, and narrow gladed trails. Snowboarders are banned from lift, but they may hike up to slopes if they wish. Skiing & Snowboarding -- This sweetheart of a ski area has many fans. Its centerpiece is Lincoln Peak, with many trails leading to Lincoln Peak Village. The village has a hotel and other residences aside the slopes, a store, various restaurants, children’s day programs, and a ski and snowboard school. Sugarbush is known for its great woods and back country with natural snow in the Slide Brook Wilderness Area. Terrain is rated 20 percent beginner, 45 percent intermediate, and 35 percent advanced. Sugarbush also includes Mount Ellen, a more casual site with an excellent terrain Park. Everything Else--The large day lodge has a food court, the Castlerock Pub, an outdoor patio and barbeque area. Timbers serves upscale food year-round. Also: ski shops, rentals, lessons, child care, pool and hot tub, spa, ice and rock climbing. 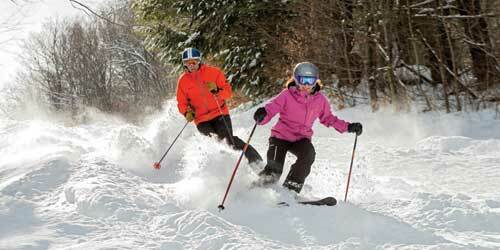 Skiing & Snowboarding -- Located in southern Vermont, Okemo Mountain Resort is a family-operated, four-season, playground. Owners Tim and Diane Mueller also operate Crested Butte Mountain Resort, in Colorado, and Mount Sunapee Resort in N.H. Winter sports enthusiasts love southern Vermont's highest vertical drop and vast trail network over five alpine areas. Terrain features include Okemo Superpipe, The Zone, Tomahawk Park, Hot Dog Hill Terrain Park, OMS Crazy Train Progression Park, Robbins' Nest, Bounder Park, Broken Arrow, and NASTAR Race Arena. There also is Nordic skiing, snowshoeing, ice skating, a mountain coaster attraction and snow tubing. Everything Else -- Accommodations include slope-side condos, the Jackson Gore Inn, Adams House, Bixby House and other area lodging. The mountain has six places to dine. There is a Ski + Ride School and racing programs.